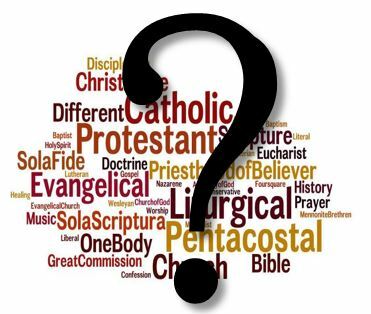 Westwood Church of Christ » Is Denominationalism Scriptural? We live in a world of religious confusion. There are literally thousands of religious denominations claiming to follow the Bible and declaring allegiance to Christ. Attitudes of tolerance have developed toward all these differences. Many believe God approves of all the conflicting denominations. Yet most have never considered the meaning of the term “denomination,” or examined the word of God to determine if denominationalism is scriptural. The word “denomination” signifies a part of a whole, a class, or division. When one searches the Scriptures he finds that nowhere is it suggested that the church of our blessed Lord is made up of divisions. Finally the teaching of Christ’s New Testament advocates unity and condemns division. The division among the Corinthians was condemned (1Cor. 1:10-13). The Scriptures state Christ’s church is His body and that there is only “one body” (Eph. 1:22-23; 4:4) . Yet the denominations say there are many religious bodies that make up the church. Who’s right? We can be Christians without being members of any denomination by taking Christ as our creed and the Scriptures as our only guide. If we will simply become Christians (Acts 2:37-38; 8:12, 35-39), serve, and worship God the way the early disciples did (Acts 2:41-42), we will be a congregation, or church of Christ for which He prayed, died, and directs us to be in the Scriptures.